Amazon now has a full family of Echo speakers — the only hard part is choosing which one to get. Think about Amazon and where it started. First, shipping books to your home. Later, shipping everything to your home. Maybe Amazon Echo — and Alexa along with it — won't be the most important legacy of the Seattle-based company, but you certainly could make the argument. Because think about another product that lasted as long as the first-generation Echo. The tube-speaker was introduced in late 2014 and became widely available the following summer. Now, toward the end of 2017, we get not one but two new takes on the original. The OG Amazon Echo has a new look. And the upscale — and pricier — Echo Plus crams more sound into the old design. Which one's right for you? And where do these fit in the family that's quickly become one of the quickest invites into any home? Let's do this thing. This is the Amazon Echo and Echo Plus review. That brings us to the new generation of Amazon Echo, which builds on the past without totally rebooting it. There's still the $49 Echo Dot, of course, which is the gateway drug. Plastic, inexpensive and meant to sell. If you don't know where to start, start here. Two new choices: One that sounds decent, and one that sounds better and is a smart home hub. The redesigned Echo comes in at $99 and is less of an impulse buy. But it looks much better than the original Echo. 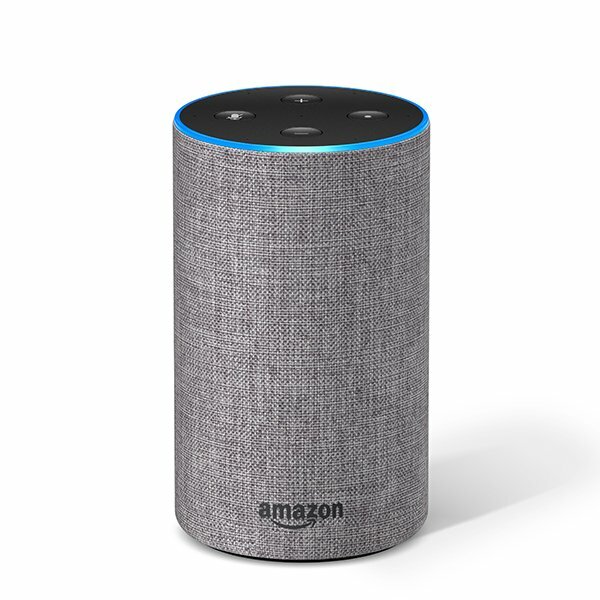 The top face is just like the Echo Dot, plastic with physical buttons for volume up and down, microphone mute, and an action button, with an LED light ring all around. The sides of the cylinder come in a fabric, or a wood or plastic veneer for $20 more. And the whole thing is shorter and wider than the OG Echo. It's more along the lines of Google Home, actually, though it hits $30 cheaper. And then there's the $149 Echo Plus. It shares the design of the original Echo nearly identically. (If there's a visual difference, I haven't noticed it yet.) Just two buttons up top — mic and action — with the top centimeter or so rotatable to control volume. Echo Plus also can serve as a smart home hub, if you wish. The new Echo speakers share a power plug on the back, along with what may actually be the most important new feature — a 3.5mm external audio jack. So if you're unhappy with the way these things sound and want to plug them into something else — a full stereo system, even — have at it. That's a feature that's been left for the Echo Dot (and the don't-call-it-an-Echo portable Amazon Tap until now. And, well, that's it. Save for the smart home hub thing on the Echo Plus, these all do exactly the same things. You can ask them questions. Make lists. Set reminders. Control things. Play music. Make calls — to other Echo devices as well as to actual phone numbers. The differences between them are physical design, of course, audio quality, and then price. The redesigned Amazon Echo, however, is a looker — and in more ways than one. Start with the price; $99 is a pretty sweet spot for a decent connected speaker. Not so much as to cause regret down the road, and nearly low enough to be an impulse buy. The Echo (and Echo Plus) now sports an audio-out port! How's it sound? Pretty darn good, actually. Leaps and bounds over the Echo Dot, of course. And I think it sounds better than the original Echo despite having a smaller tweeter inside. You get a decent amount of bass. Nothing earth- (or ear-) shattering, but it's not bad at all. The highs come through as they should, too. Amazon Echo Plus ($149 on Amazon), left, and the original Amazon Echo. Everything old is new again. For $149 you can enjoy the look of the original Amazon Echo with the best sound quality of any of them. You get richer bass notes out of the Echo Plus, crisper highs, and the whole thing just sounds better than the Echo. I still think the Echo and its redesign look better than the Echo Plus, but that's certainly subjective. I don't think any of that is a reason to pay the $50 premium over the Echo. Sure, it sounds better. But not that much better. Echo Plus still has the old two-button design. However. ... I do think it might be worth it if you're starting to get into the smart home game, because the Plus will serve as a hub. And that's a big deal because as you collect more and more things, you can end up with more and more hubs. Will Echo Plus solve them all? That's doubtful, because there are too many things out there, and not everyone's on the same page. But it'll help, and that alone might be worth the $149 asking price. The Dot also is now my least favorite-looking Echo. 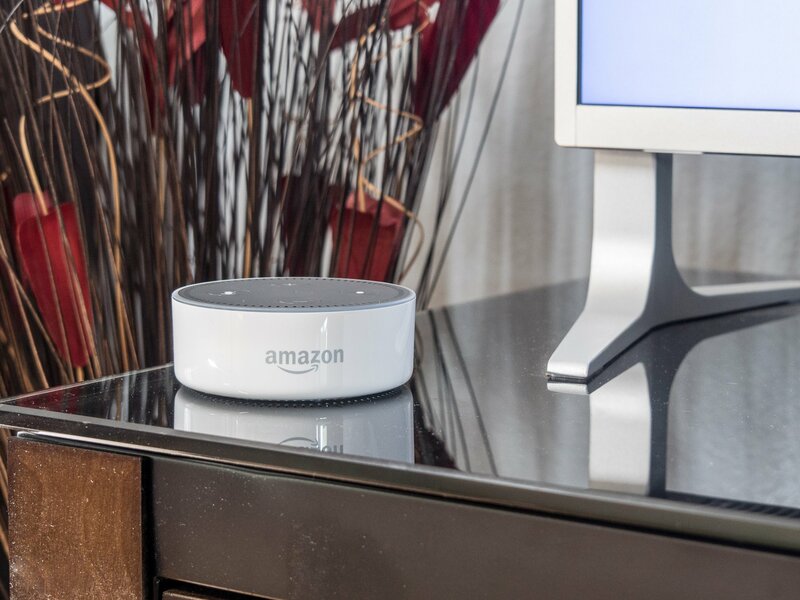 But if you're dead set on trying out the Amazon assistant universe and don't want to spend a lot of money doing it, try an Echo Dot. A couple years past the launch of the original Amazon Echo and the novelty certainly has worn off. Smart speakers with their own digital assistants aren't anything new anymore, and they're no longer expensive. Google and Amazon each have a $49 offering. You can get Alexa-compatible fare for even cheaper. You can't go wrong with either the new Echo or the Echo Plus. Both are capable smart speakers that perform within their price range. But you still have to make a choice here, right? If you do want to get into the smart home thing, spend the extra $50 for the Echo Plus. It'll likely make things easier for you down the road when it comes to connected accessories.